This past Friday marked the opening of our new exhibition at the Kelsey: Death Dogs: The Jackal Gods of Ancient Egypt. My favorite object in the exhibition is a desiccated dog skull excavated from Karanis, a Roman-period village in Egypt. Here at the conservation lab we have affectionately named the skull Kalbi, or “my dog” in Arabic. While he is not the prettiest specimen, the conservator in me is amazed by Kalbi’s phenomenal state of preservation. Large portions of the dog’s skin were preserved by the arid desert environment at Karanis. Even his eyelids and nose remain! Today, I thought I would share with you the challenges of displaying Kalbi, as well as how we overcame those challenges. Challenge 1: The dried skin covering the skull is extremely fragile. Skin is composed of a network of collagen fibers — chains of amino acids that are spiraled together to form fibrils that, in turn, bundle together to form fibers. As the skin covering the skull dried, the fibers shrank and stuck together, causing it to become brittle and cracked. In several locations along the edges, the delicate skin was in danger of completely falling off. Solution 1: Cracks in the skin were stabilized by gluing small pieces of Japanese tissue beneath the cracks. The tissue acts like a splint; it bridges/reinforces splits in the skin and secures loose pieces in place. Gluing Japanese tissue mends under cracks in the skin. Challenge 2: Several of the teeth had fallen out of the dental aveoli — the small voids in the jaw that hold the roots of the teeth. While we could easily secure the teeth in place with a small amount of adhesive, figuring out their correct anatomical location was trickier. Solution 2: For assistance, we turned to Richard Redding, a Kelsey Research Scientist and zooarchaeologist (specialist in archaeological faunal remains). Richard determined the proper placement of each tooth, and we glued them into place. Challenge 3: We needed to find a way to put the head back together. The dog’s head came to the lab in two pieces; without muscles to hold them together, the skull and jaw had separated. Unfortunately, the fragile teeth and delicate skin along the lower jaw meant that the skull could not safely rest on top of the jaw. Solution 3: A mount. The creation of mounts is typically the domain of our talented exhibition preparator Scott Meier. 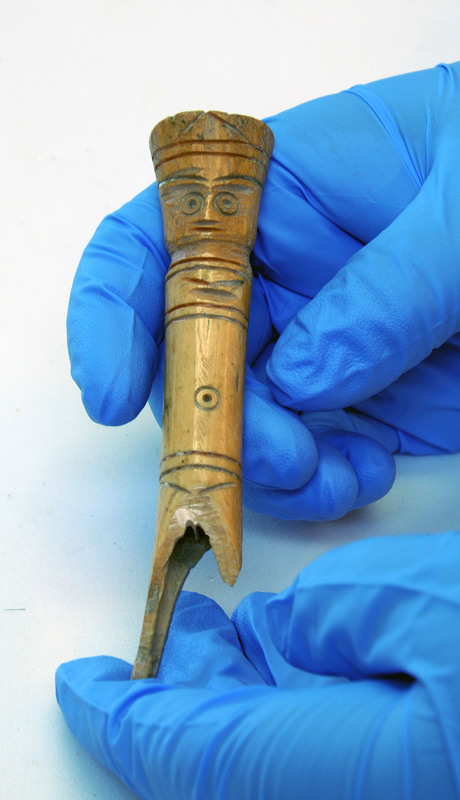 When objects are particularly fragile, however, Scott and the conservation staff collaborate. In this case, we combined forces to create a mount that would allow the skull to float above the jaw, giving the appearance of a complete head without allowing the two pieces to touch. Scott made a raised support using a carved wood block and brass dowels. To the top of the wood block, I attached carved pieces of ethafoam, which keyed into raised areas along the base of the cranium, locking it into place. With the skull held above, the jaw could be slid into place below. Each piece is separately supported, but Kalbi’s head appears complete. Kalbi on display at the Kelsey Museum. As you can see, the preparation of objects for exhibition is a team effort! We hope you will come by to visit Kalbi and all of the other artifacts on display in Death Dogs: The Jackal Gods of Ancient Egypt. The Kelsey Conservation Lab is pleased to welcome Madeleine Neiman as our new Samuel H. Kress Fellow for the 2014–2015 academic year. Madeleine is a recent graduate of the UCLA/Getty Program on the Conservation of Archaeological and Ethnographic Materials, and has an undergraduate degree in anthropology from Bryn Mawr College. She just completed a year-long graduate practicum internship at the Arizona State Museum (University of Arizona) and has also previously worked at the Colonial Williamsburg Foundation, the Alaska State Museum, and the Anchorage Museum, where she focused on the conservation and technical analysis of ethnographic and archaeological materials. 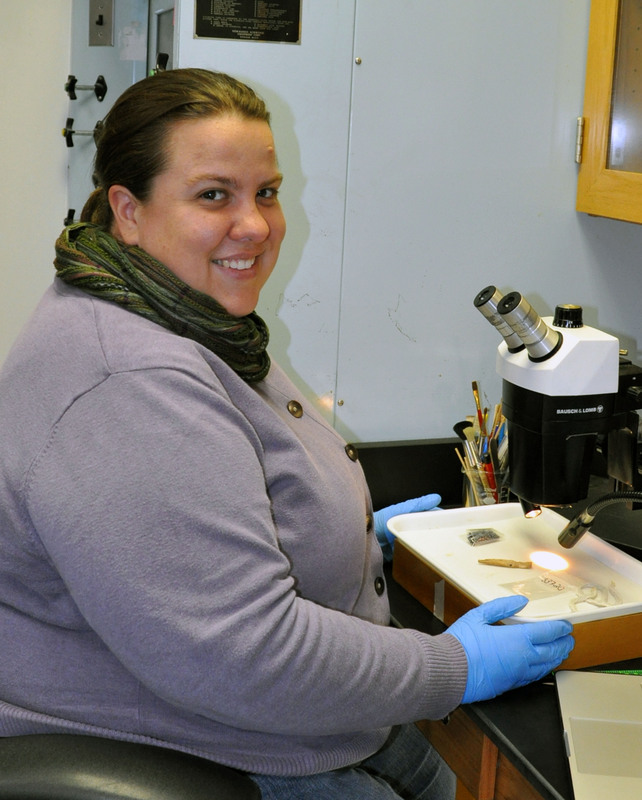 At the Kelsey, Madeleine’s research will center on conservation projects for the Seleucia collection. For example, she will research and treat an incantation or “demon” bowl from Seleucia, an unglazed ceramic bowl painted with magical spells designed to entrap demons. The inscriptions on this bowl are obscured by a darkened surface layer (possibly a modern coating) and by the presence of chunky salts, probably deposited while the bowl was buried. Important goals of conservation treatment will be to stabilize the bowl’s inscription and make it more legible. In addition to the bowl, Madeleine will survey and study a group of bone figurines from Seleucia. The figurines are carved in both stylized and naturalistic human forms, and some are painted. Madeleine will collaborate with zooarchaeologist Dr. Richard Redding, as well as materials scientists at U-M and elsewhere, to answer a variety of research questions about the figurines. 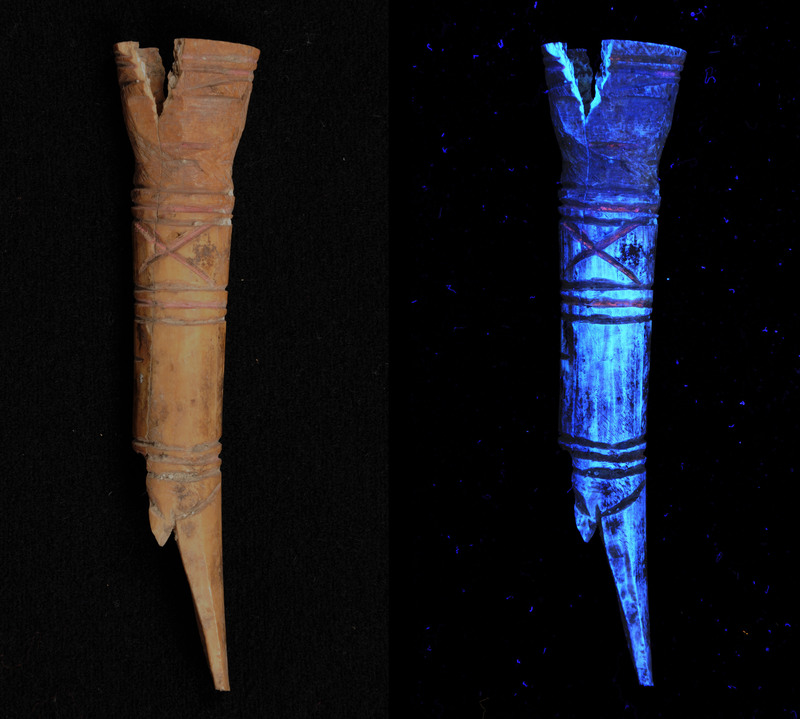 We are thrilled to have Madeleine here to research and treat these unique artifacts, and we’re grateful to the Samuel H. Kress Foundation and the Foundation of the American Institute for Conservation for supporting her fellowship. Welcome, Madeleine!